July if the official month for family reunions and we can totally see why. With school out and warmer weather, summer is ideal for families to get together and reminisce on all the amazing memories they have created. Sometimes reunions are the only the opportunity individuals have to see extended or even immediate family so it only makes sense to plan the best reunion ever. Are you the one planning a reunion or the ultimate family vacation? It doesn’t matter if you’re planning your first family reunion or your tenth, Customized Girl has a board filled with family reunion ideas to help you create new memories that will last a lifetime! Pinterest is Customized Girl’s go-to resource for new and trending topics. We really love seeing what is currently trending among pinners and how they are visually building out their personal boards. It’s not only a great research tool but an amazing way to store all of our concepts in one place. 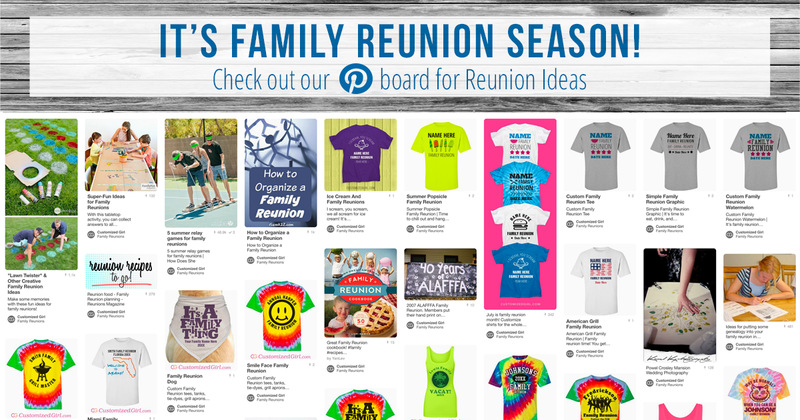 We are constantly adding to our family reunion board with new and fresh ideas then translating as many of those concepts into custom family reunion shirts for our customers. This doesn’t mean Pinterest is only an excellent choice for us but it’s even better for you. We’ve collected all of our favorite tips and tricks and put them all on our family reunion board to assist you in your party planning. No need to search the internet – we’ve already done it for you! This board is an amazing resource for every kind of family gathering that you can imagine! You can easily find everything you need to plan the perfect party for adults and kids. If you are still struggling to think of the most perfect additions to any event or party then make sure you check out this board! Customized Girl’s pinterest page is a great source for custom gifts and holiday ideas! Parades, fireworks, and tasty cold beverages – What isn’t there to love about Independence Day? This patriotic holiday is one big celebration of America’s birth and the commemoration of our founding fathers as they declared our independence on July 4, 1776. Most American’s partake in similar activities on this day like parades and fireworks but everyone has their own 4th of July traditions. 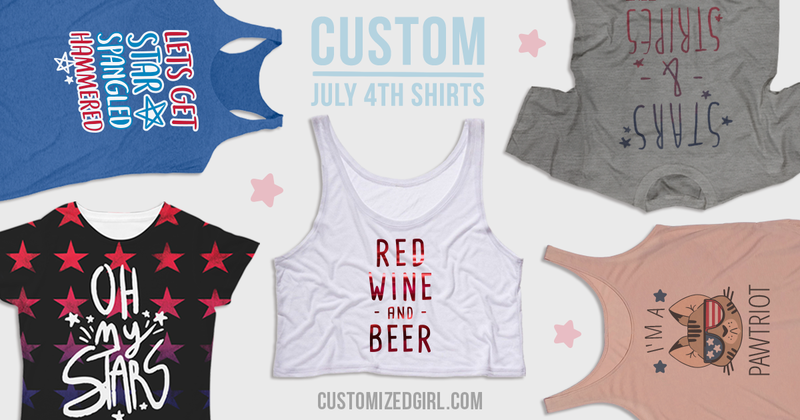 Regardless if you’re sitting pool side or raging at the neighborhood block party, Customized Girl has the best 4th of July shirts to celebrate your freedom! 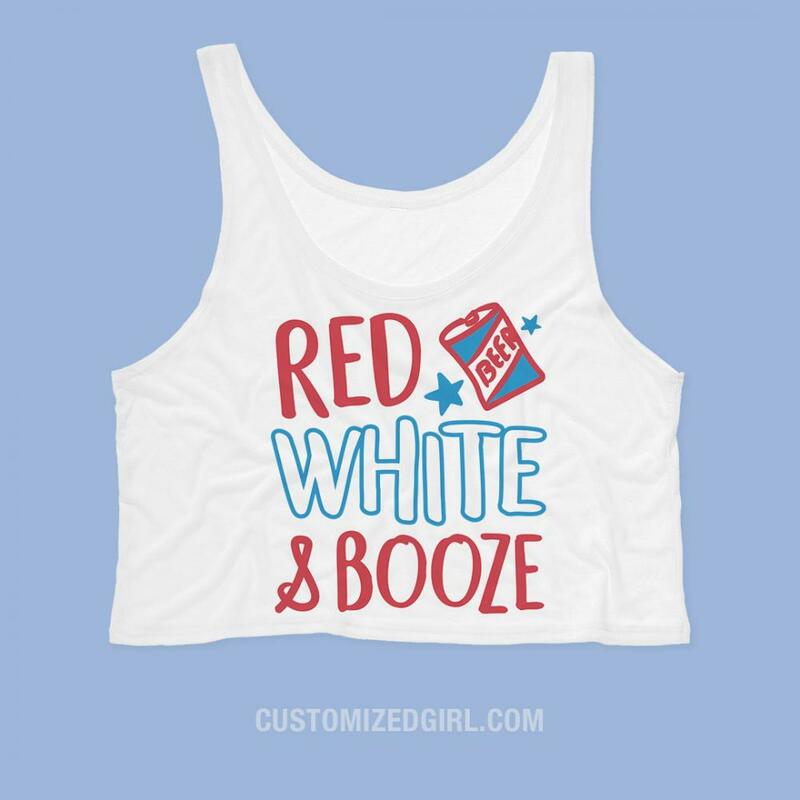 Each and every year our amazing team at Customized Girl do their best to bring you the newest and trendiest 4th of July apparel. This year we are particularly excited to announce our new and exciting printing process that allows users to print designs from edge-to-edge. Because nothing says ‘Merica more than you reppin’ that flag across your chest. The possibilities are endless when it comes to our custom 4th of July apparel. List everything you love about this holiday with a custom ampersand shirt or customize a bathing suit while boating on the open water. Our design center makes it effortless to customize any design in the gallery. Swap your favorite patriotic design onto a custom tank top or crop top if you plan on being in the sun all day or creating matching designs between you and your little one with a custom baby onesie. Our custom apparel is lightweight and comfy so that when families and friends get together on this day they can truly sit back and relax with the best 4th of July shirts. 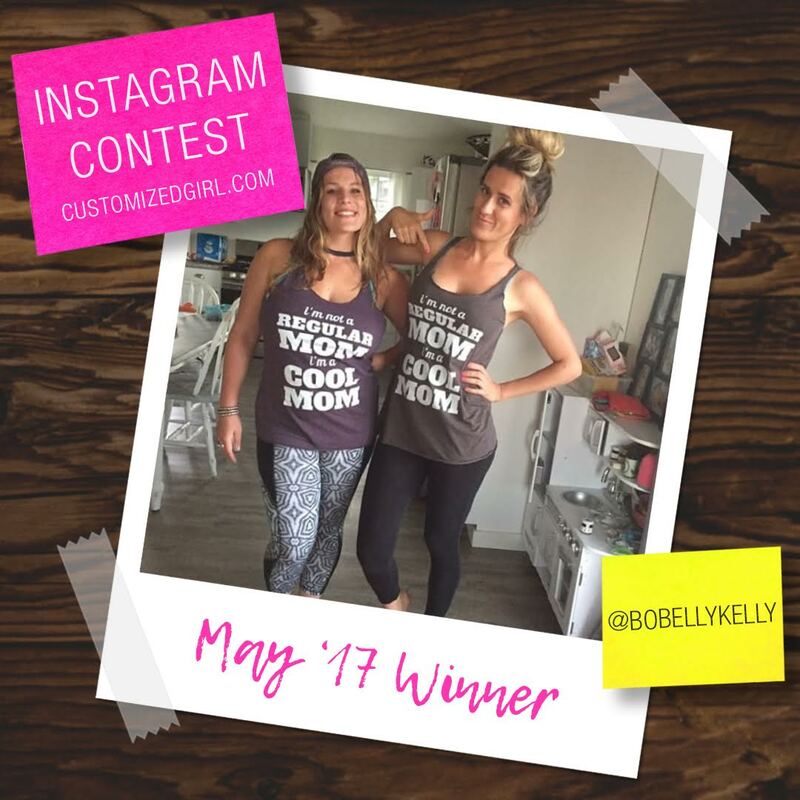 May 2017 Selfie Instagram Winner! A big congrats to Customized Girl’s selfie winner for the month of May! We are excited to announce that Customized Girl’s selfie winner for the month of May is also our first video winner! 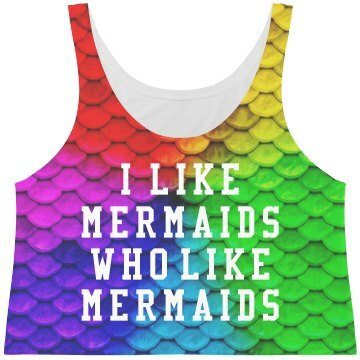 These two super cool mama’s celebrated Mother’s Day by customizing tank tops and snapping a playful video to let everyone know they’re not regular moms – they’re cool moms. We couldn’t agree more and think that all mothers and mom-to-be’s should follow their lead and let their voices, statements, and opinions be heard with custom apparel. It’s really a lesson everyone should learn – cool moms are the best moms. Father’s Day is always celebrated on the third Sunday in June and at Customized Girl, it is our duty to remind you to not forget about dad this year! That’s right. The man, the myth, the legend who has given you sage advice and is always full of infamous dad jokes. Even through all his quirks and scolding punishments, you love your dad and you want him to know it. The pressure to find a gift that is thoughtful and personal enough can be challenging year after year. Enter Customized Girl. 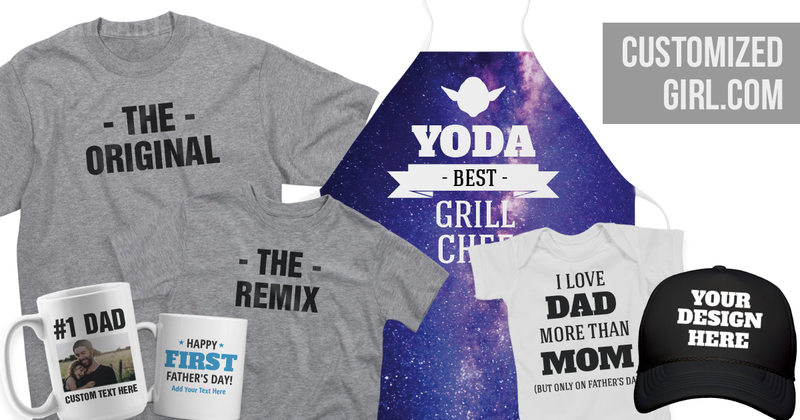 We’ve put together some of our favorite custom Father’s Day gifts to help you create that memorable gift he’ll never forget. Your dad is the one who taught everything about your favorite sport and hasn’t missed one of your games yet. Design your dad a custom shirt that he can wear while cheering you on from the stands. We offer designs that are perfect for whatever sport you play and this include shirts, hoodies, bags, hats, and more. All of our designs allows users the option to customize which means you can easily add your school color, number, and name. One of our personal favorite Father’s Day gifts for Dad are matching father son shirts and matching father daughter shirts. These matching shirts are ridiculously cute for soon to be and new fathers. Choose a design combo from our gallery for dad and his little one that reflect their personalities. Easily swap out your favorite design onto any style of clothing. This is ideal if your little one is a newborn, a toddler, or preteen because Customized Girl offers a variety of custom youth apparel. This year we are excited to announce edge-to-edge printing on specialty products. Aprons, pillows, and phone cases are just a few items that we offer with this new and amazing printing technique. All you have to do is choose an item from our all over printing options. From there click on the big, pink “upload image” tab and upload your image. Any photo taken with a smartphone will be big enough. You can continue to add your own text or even more art or swap the same design onto multiple products with the “swap out item” tab in the design. Once you’ve completed your design, choose a size, and add to cart. It’s really amazing! There are so many custom Father’s Day gifts to choose from when thinking of dad this year. He is the best, so he deserves the best! Celebrate Gay Pride month with a custom Equal Rights shirt. Use the coupon code below to save! Use coupon code 330JCG at checkout and get $3.00 off orders of $30.00 or more! Offer expires 6/30/2017 at 11:59PM EST.